OTTAWA—The Grey Cup arrived Sunday morning at Rideau Hall, home of His Excellency the Right Honourable David Johnston, Governor General of Canada, where it will begin its four-day stay. 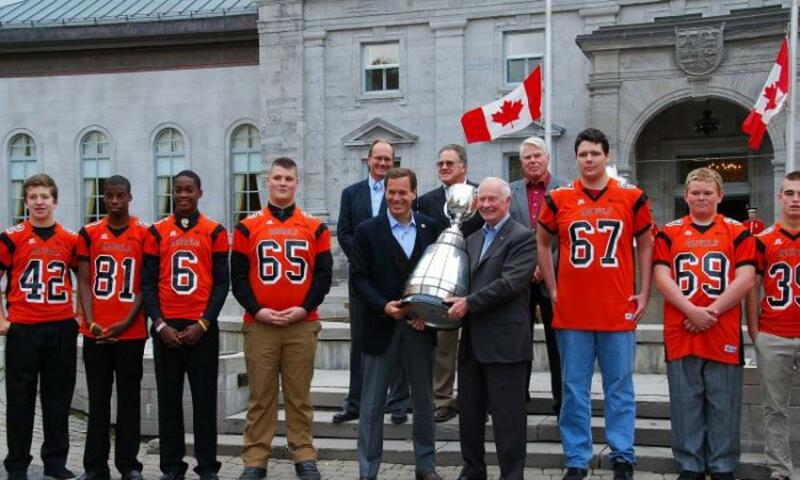 It received a warm welcome from Canadian Football League (CFL) Commissioner Mark Cohon, former CFL players Jeff Aver, Ted Smale, and Dan Dever, as well as young members of the local Orleans Bengals Football Club. This year marks the 100th anniversary of the Grey Cup championship game, the pinnacle of Canadian professional football. The Grey Cup will take place in Toronto on Nov. 25. The trophy was originally donated by the ninth governor general of Canada (1904–1911), Lord Earl Grey in 1909. It was first won by the University of Toronto Varsity Blues in front of 3,800 fans. “Lord Grey was an avid sports enthusiast who strongly believed in physical activity,” Johnston said in his opening remarks in English and French, the two official languages of Canada. Johnston went on to explain what makes Canadian football so special. Johnston spoke about the 50th Grey Cup game, which had to be played over two days as fog rolling in from Lake Ontario forced the cancellation of play in the fourth quarter. And even on Saturday, in a game in Calgary between the Tiger Cats and the Stampeders, heavy snow was already present—in mid-October. “The Grey Cup symbolizes our ability to come together across this vast and diverse country,” Johnston said, talking about the enormous significance of the venerable trophy. He also announced that he’d be performing the coin toss and kickoff on Nov. 25 at the Grey Cup. “I’m honoured to be part of this important event in the history of Canadian football,” Johnston said. Cohon elaborated about the meaning of the Grey Cup and some of its incredible history. Cohon noted the significance of the Grey Cup as an event that brought Canadians together. “It’s not just about a symbol, an icon,” he said. “Lord Grey would have it no other way!” Johnson noted in conclusion. As Johnston is the 28th governor general of Canada, he was presented with an official CFL jersey with the number 28 by an Orleans Bengals football player. The Grey Cup is currently touring Canada and will head to Montreal next Saturday where it will be at Percival Molson Stadium, home of the Montreal Alouettes.